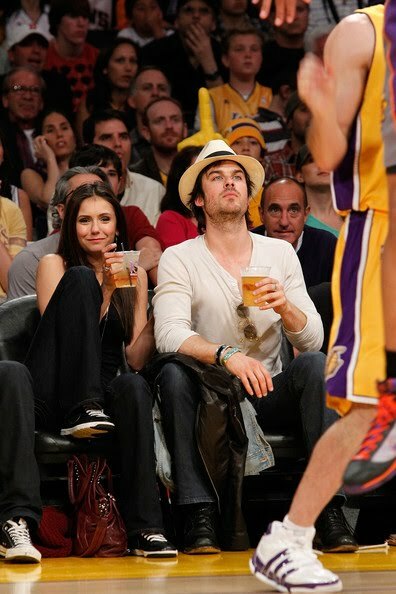 Nina Dobrev and her Vampire Diaries co-star Ian Somerhalder at the Western Conference Finals game between the Phoenix Suns and Los Angeles Lakers during the 2010 NBA Playoffs held on May 27. Nina was wearing black and white Nike sneakers with her dark jeans and tank outfit. A red bag and hat added some color. Nina's black and white shoes are a customised Nike ID design. Do they all apart from Ian have the same shoes on - that last pic?